Deborah Menelaws of Bethel Communications will be speaking at The Breakthrough Church of Wales as a guest of Prophetic Witness in Newport*. Researcher and film maker Deborah Menelaws of Bethel Communications has entitled the Watchman Conference 2016 ‘Deliver us from Evil’ as she shares her research to establish not only how but also the startling revival of Babylon Resurrected and the terrible implications for Planet Earth. You may wonder why is it important for Christians to know about such dark subjects – however Deborah now believes it is time to sound the alarm for true Christians to have an understanding of how the global and spiritual paths collide in fulfillment of prophecy as we prepare for the coming chaos which prepares the way for The Man of Lawlessness – The Beast – to take control as world leader. Deborah will show how the pieces fit into place – from Genesis 6 onwards, and will give practical tips and guidelines for every Believer to consider prayerfully as the anticipated gross darkness encroaches. FINAL MEETING FOR THE NEWPORT BRANCH OF THE PWMI WITH THE DYNAMIC DEBORAH MENELAWS FROM BETHEL COMMUNICATIONS ON SATURDAY, THE 10TH OCTOBER. As you are all now aware, The Upper Room Fellowship (TURF) has now closed and along with it, all branch meetings of the PWMI for NEWPORT. As a result, we have cancelled two of our conferences planned for the Autumn and early winter period, but we have decided to proceed with our last venture for Newport, which are the splendid seminars lined up by the dynamic researcher and film producer, Deborah Menelaws (from Bethel Communications in Scotland) on Saturday 10th October. It is an upstairs building above the “Sigma 3 Kitchens” showroom, also at 128 Lower Dock Street, and just down the road and nearly opposite “The Kings Church” at 69 Lower Dock Street. 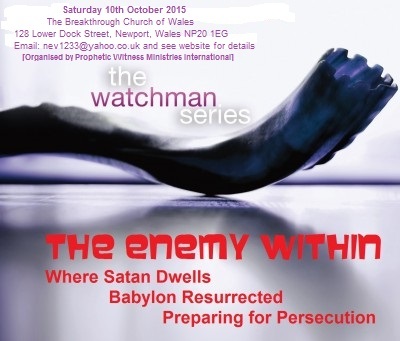 The first of the three meetings will commence at 10am under the title of “THE ENEMY WITHIN”, which is part of The Watchman Series, which is based on End Times and Last Days Events and Scenarios. Session One (10am): WHERE SATAN DWELLS! Session Two (11:30am approx): BABYLON RESURRECTED! Lunch Break (12:30 to 1:15pm approx) where light refreshments and nibbles will be supplied. Session Three: (1:30pm approx) PREPARING FOR PERSECUTION! Final Summary and Q&A section at around 2.30pm for 3pm closure. Because of lack of support in the Newport and surrounding area, the Newport branch of the PWMI will be closing down after this meeting, unless sufficient people come forward to offer their support and attendance at meetings. So please come along so that Deborah’s long trip from Scotland will not be a disappointing affair with a low attendance. She is a dynamic researcher in the film and media industry, particularly relating to the persecution we, as part of the Laodicean Latter Day Church, are going to have to endure if our faith remains resolute under the severe persecution likely to come our way! If you need any further information, please give me a ring on 07808 251502 or contact me via email at nev1233@yahoo.co.uk.